‘Teething normally begins at around 6 months of age’. Twelve weeks old and teething has hit us like a tonne of bricks. Our first two months of newborn life were filled with puke and discomfort, to put it bluntly. Harrison’s inability to bring up wind, and desire to feed 24/7 meant that pretty much all of his milk in the first few weeks ended up projectiled over himself, myself, or our couch. As we neared three months old, we changed milk and voila - the problem was solved and we had a little happy baby for all of three days. Cue teething to come and knock us off of our happy little pedestal. We were never going to have that easy a ride were we? If I'm honest, I hadn't given teething a second thought until it hit us head on: I thought I'd have a good few months before I even had to think of it, so I can now thank the lord we are Nuby Brand Ambassadors and they'd obviously planned more in advance than we had. 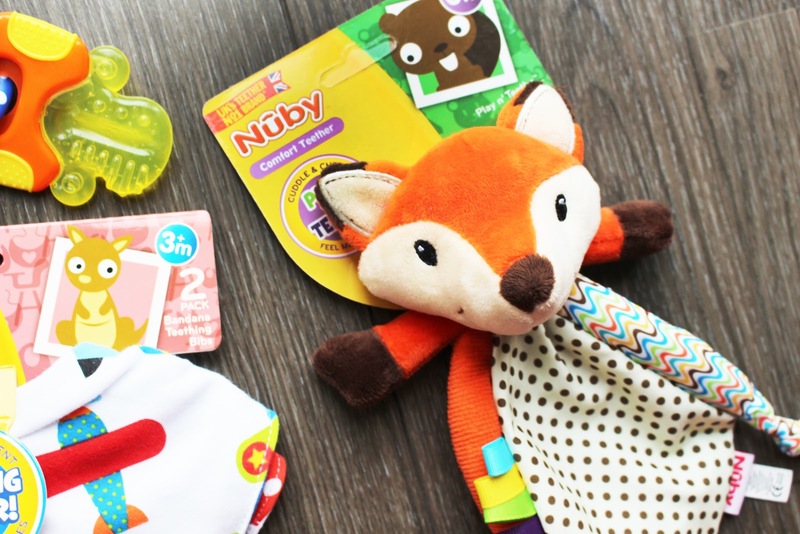 Every month or so, we receive a care package of Nuby bits that are in line with Harrison's age - last month we'd opened a box to be confronted with more teething bits than we'd ever need. I won't even lie, I turned my nose up and the box was left in a corner, waiting for us to hit the 6 month mark when the elusive teething would begin. HA! Thank god Nuby were less idealistic than I was. Less than a week after I abandoned our box I went groveling back, and we haven't looked back since. Nuby - I'm sorry for doubting you... Google, you lied. 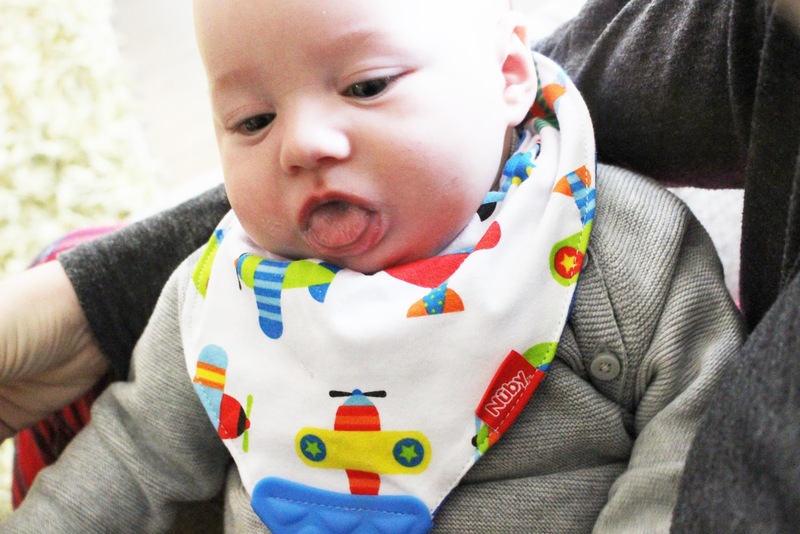 One of my favorite bits this month is our bandana reversible bibs - they come in a pack of two and are both reversible, and these are some of our favorite bibs so far. 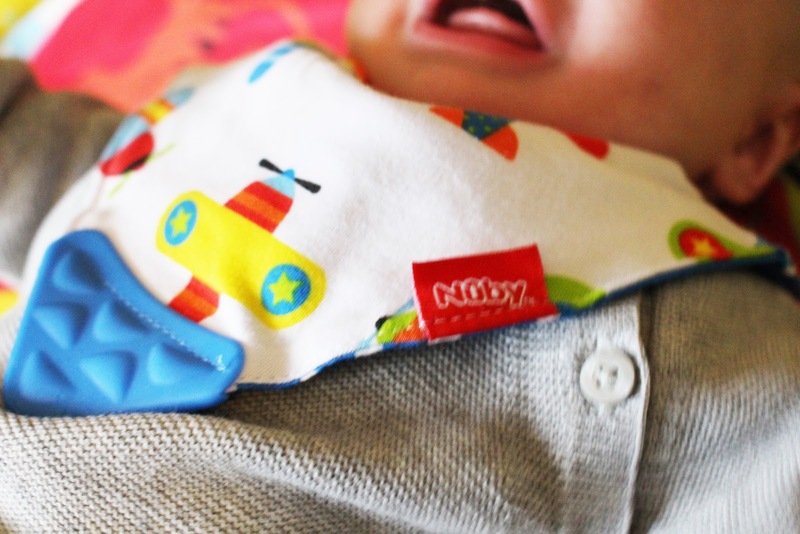 They are absorbent cotton, so unlike most bibs we have, they don't go that 'crusty' way when covered in baby drool, and the fact that they are reversible means we get double the amount of uses (barely any at the rate of dribble we're at now...) out of a single bib. I also love how vibrant they are, we've washed them both a good few times and the color is still as bright as ever. He's not yet worked out how to use the teething triangle, but it's there for when he eventually gets his head around the idea. 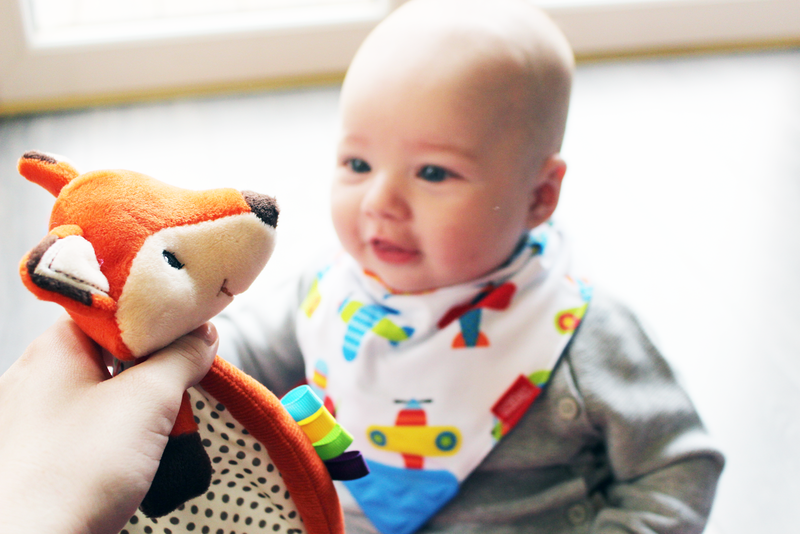 The bibs may be mums favorite, but Harrison's is without a doubt the little Play n' Teethe fox - it's a little plush toy with a teething blanket attached and various little soothing bits that he can chew on to ease the pain in his gums. The real winner for him is the teething blanket - it's made out of that material that crinkles, and that alone is enough to keep him immersed for hours - that's a lie, 15 minutes tops, but that's as good as we're probably going to get. I will say that I'm not sure how it'll hold up over the next few months, instead of latching on to the specific soothers on the toy, Harrison tends to put the little nose straight in his gob, so we'll see how the material holds up after being slobbered on for weeks on end. We were also sent numerous Icy Bites, and a Soothe n Teethe, but as I've already said, Harrison's not really got the hang of biting down on your typical teethers yet, so for now they are on the back burners. We were also sent out another set of the Natural Touch Feeding Bottles, and we're still as loyal as we were before. The NUBY bottles have given us no problems whatsoever, and we'll be picking up the next size up in the few month or so as our little grubber is taking 7/8oz before bed so we're nearing the limit. Don't get me wrong, a special bib and a teething teddy are never going to cure the teething terrors - but little things go a long way, even if its for the distraction factor, or to save me washing one hundred bibs a day. Both are currently half price on the NUBY website, so I can't recommend them enough for the sake of a couple of pounds. Teething can be hellish, but slowly but surely we are stocking up on little bits to help us through it. 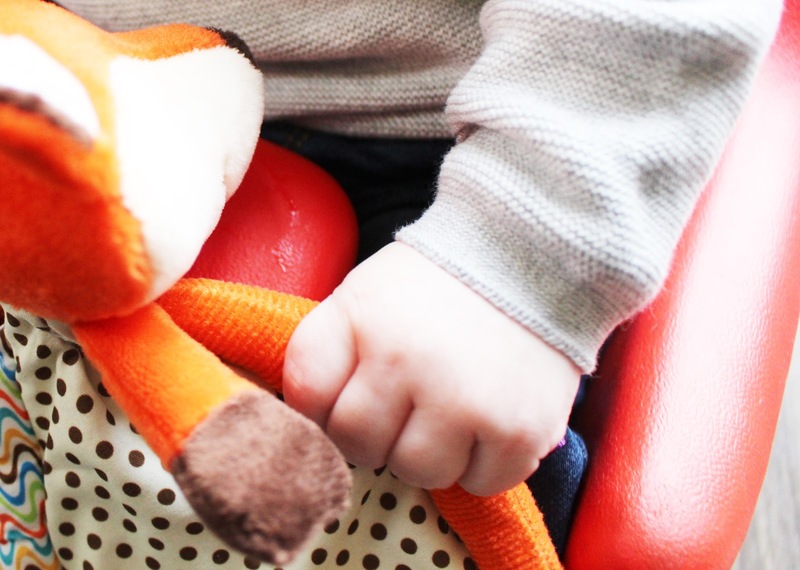 What's your teething necessities? Have you got any tips that can help make the next few months just that little bit easier?